Built around 200 years ago, Haveli Dharampura derives its name from its locality. Dharampura was named after the word Dharam-religion. The Haveli documents showcased that the Haveli belonged to a Muslim family and then was owned by a Baniya family (Business caste). It took nearly 6 long years and 50 odd workmen under personal supervision to achieve the desired results of this unique hotel that speaks of Mughlai royalty and architecture. 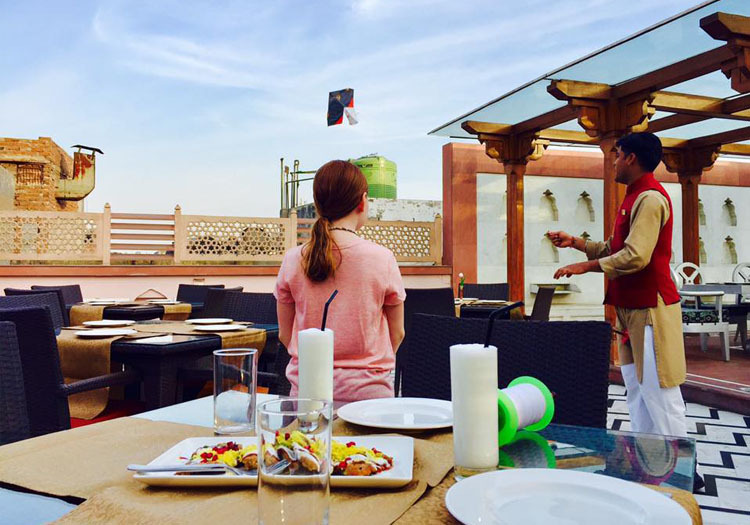 Located amidst the hustle-bustle of Chandni Chowk, the place is organizing a Kite-flying experience on the roof-top of the Haveli Dharampura with a 3-course High-Tea to go with it. Imagine! The stupendous view you’re going to have when you stand on the Rooftop and get a glance at the entire Old Delhi. Don’t miss this opportunity to stand on a roof-top in Chandni-Chowk and look at the sky covered with colorful kites from the Haveli rooftop, especially when a cool breeze takes them higher. What You’ll Love about the Haveli? Since the Haveli Dharampura has a history of its own and is one of the historical and archeological spectacles of Delhi, the historic place has other incredible experiences for you as well. There are rooms named as ‘Jharoka Rooms’ and ‘Diwan-E-Khas’ where you might feel like you’re in the ‘Jodha Akbar’ movie. There is a unique restaurant, the Lakhori restaurant that serves Modern Indian and lip-smacking Mughlai dishes while the restaurant has naked brick-walls in some portions which have been untouched to preserve the historicity. You can even book the place for photo shoots and don’t forget to check out the Gallery where you can dive into the history and know more about the ‘making’ of this spectacle of Chandni Chowk! Don’t miss it for the word. Living in Delhi, if you’ve not explored the rooftop of this Haveli Dharampura then people, you’re missing out on a lot!